Latest post Fri, Apr 19 2019 11:23 AM by SteveK. 30 replies. "This error message has been seen with Mac systems and NTFS connected drives." "It has also been seen with "Microsoft NTFS for Mac" by Paragon Software" installed." Not installed on my machine. Can you explain when it happens? thank you for your reply. quick note: in the original post "Download Mojave NOW,..." I was referring to the post by Pedrodor who also mentioned the issue. So, I get this error once in a while when starting-up of the software: it stalls, then quits with a segment error quote. In this case, only restarting the machine gives me the chance to launch MC again. Sometimes I get the error within the usage of the software - then I just have to click OK and can continue with MC. As said: no ntfs volume, no windows software, that is known for causing this error. Shot in the dark (watch out for crickets): Maybe the AMA database is looking for a file that you once had on a NTFS drive? Try moving the AMA Management folder to a different location and see if the problem goes away. Arrh, higgledy-piggledy! Thanks hbrock, but you missed. But it was close - as far as I can tell. Input reference sounds hardware-ish. Got a I/O device attached? Wrong sync reference going into hardware based on Format? If it happens on launch Avid hangs and crashes. If it happens while working I can usually keep going. My media is on a mac formatted USB3 drive. i have a second display hooked up via mini display port. No input/output devices hooked besides a powered USB hub. This error is killing me guys...either through some combo of Mojave and 2018.11 I can't start avid now. I uninstalled and went back to 2018.10. It seems to relate to AMA because the error comes up during the AMA initialization process. I'm going to try copying media to a different drive and see if that helps. Reverted to 2018.5 in the meantime and it works. 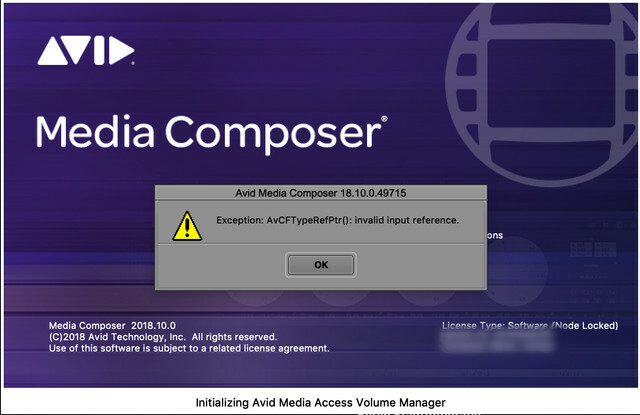 2018.5 = best stable version of avid in the past year. Turns out it didn't fix the problem (reverting to 2018.5). Last night I restored from a time machine backup on high sierra so will stick with that and install from scratch once this project is over. which suggests a doube negative" Maybe consider not uninstalling "Microsoft NTFS for Mac" by Paragon Software." I have this software and have tried with it quit and installed and it makes no difference, should I uninstall it?